An event is being held to mark the anniversary of the programme which shed a light on a dark part of Irish society. 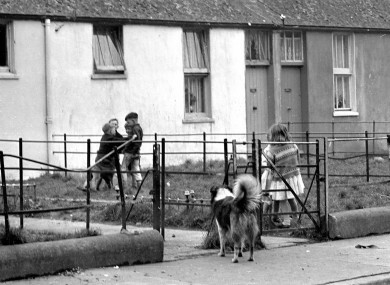 Children play in Dublin in the 1960s. IT WAS JUST fifteen years ago, but in some ways it feels like an entirely different country. It was May 1999 when RTE aired the groundbreaking three-part documentary States of Fear, detailing the sustained abuse suffered by children in church-run industrial and reformatory schools in Ireland between the 1930s and the 1970s. Documentary-maker Mary Raftery, who died in January 2012 of cancer at the age of 54, described the abuse as “extremely vicious and sadistic physical abuse, way off the scale, and horrific emotional abuse, designed to break the children”. The documentary challenged the Irish state and the Catholic church, and led to an official apology from then-Taoiseach Bertie Ahern and the establishment of the Ryan Commission into institutional abuse. Now, fifteen years on, a series of events are being held to mark the anniversary of the programme which peeled back a layer on Irish society and led to much soul-searching. The Mary Raftery Journalism Fund, which was set up in 2012 in memory of the campaigning journalist, is running a series of screenings and panel discussions at the Irish Film Institute later this month, including a full screening of the States of Fear programme. “The primary purpose [of this] is to highlight the very important role which investigative journalism and and documentary-making can have,” said David Waddell, the chair of the Fund. “While gaps remain, the States of Fear documentary series was hugely instrumental in opening a public debate and a policy response on child abuse”. Speakers including writer Roddy Doyle, Colm O’Gorman of Amnesty and Patsy McGarry of the Irish Times will be taking part in discussions on the day. “The anniversary event offers an opportunity for everyone – from journalists to policy makers and those charged with the care of our children – to reflect on where we have come since,” said Waddell. “It gives young adults, who won’t recall the original broadcasts, an opportunity to experience an important part of our history. “Ultimately, it will highlight the role and importance of quality, investigative journalism”. The States of Fear event takes place on Saturday 24 May at the Irish Film Institute in Dublin. Email “Fifteen years on, how States of Fear changed Irish society ”. Feedback on “Fifteen years on, how States of Fear changed Irish society ”.